There are many things in life to be afraid of. 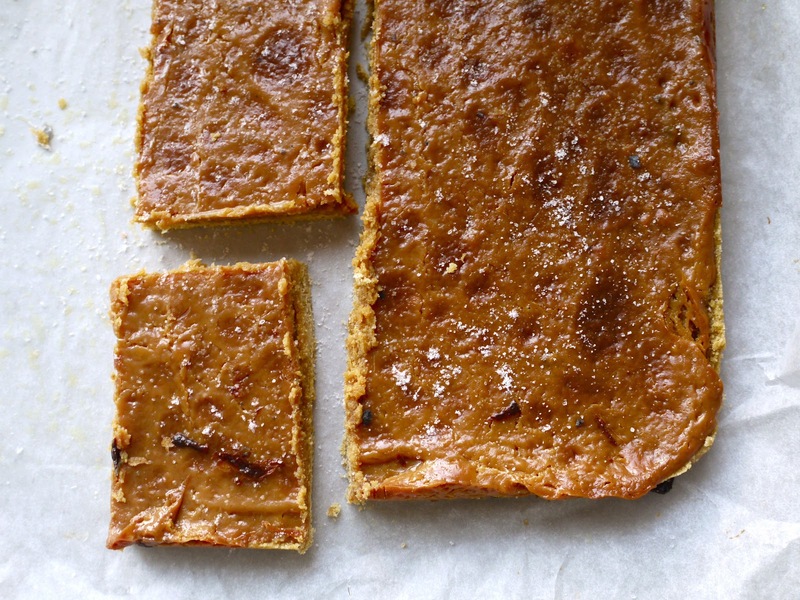 But, being a person who tends rapidly towards non-endearingly sweaty anxiety I can say this with confidence: adding salt to your caramel slice – or your caramel anything – should not be on that list of things you fear. As I was saying, don’t feel held back by the salt component of this caramel slice. The recipe is in the new issue of the excellent Cuisine magazine, and even though it’s one of those hand-it-to-you-on-a-plate kind of recipes where you can tell immediately by the title that it’s going to be really good, I was not prepared for just how amazingly amazing it’d taste. As with browning butter in last week’s recipe, salt sharpens up every good thing about caramel. 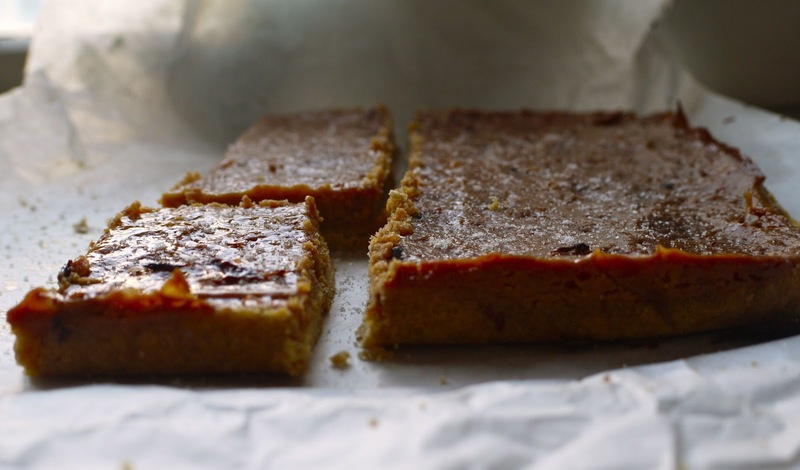 It becomes more roundedly toffeed, more intensely buttery, and less straightforwardly sugary. Lay that salt on. I can’t lie that it helps if it’s the kind of nice, flaky sea salt that costs twelve times more than the regular stuff. This recipe is pretty uncomplicated, with just melting and stirring and then more melting and stirring involved. 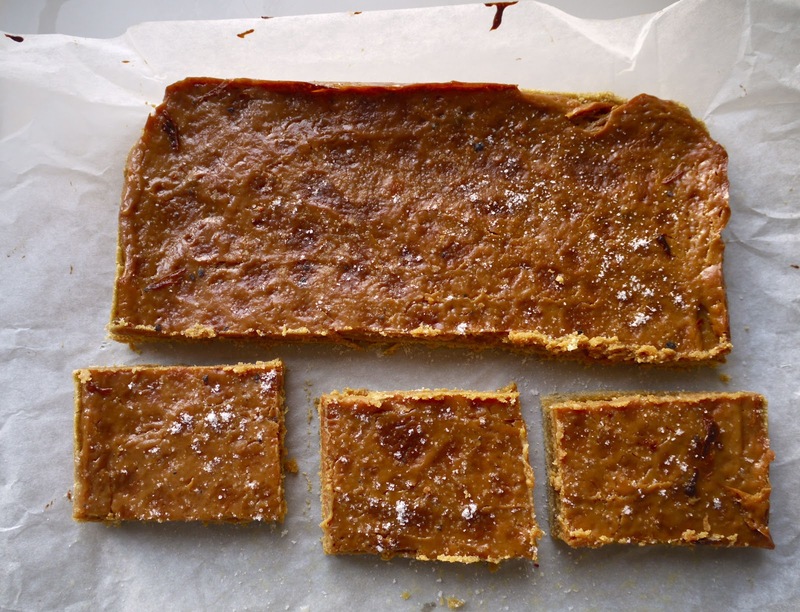 However, there’s a few elements that make it not your average supersweet chocolate-topped caramel slice. Not that I’m anti the regular stuff, I struggle, and always have, to choose anything else when I go to bakeries. First, there’s the salt. 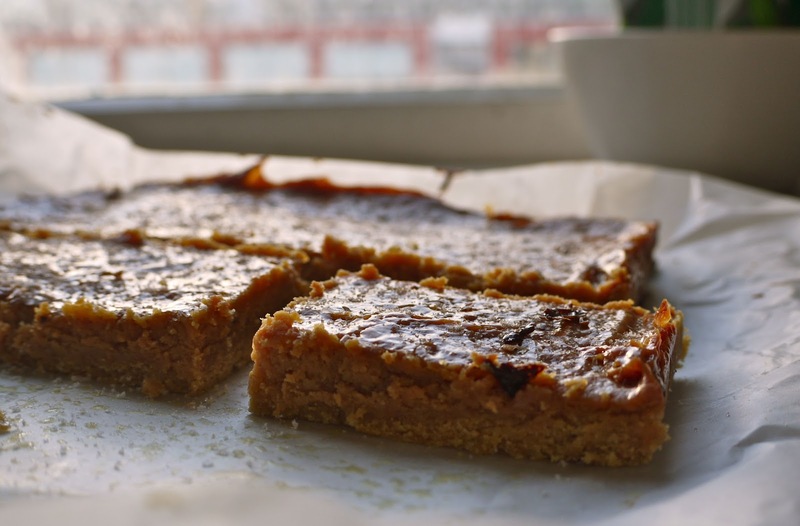 Then, fine cornmeal is added to the base, giving a little contrasting grit and crispness, and echoing the sweetness of the contents more than just plain flour would. 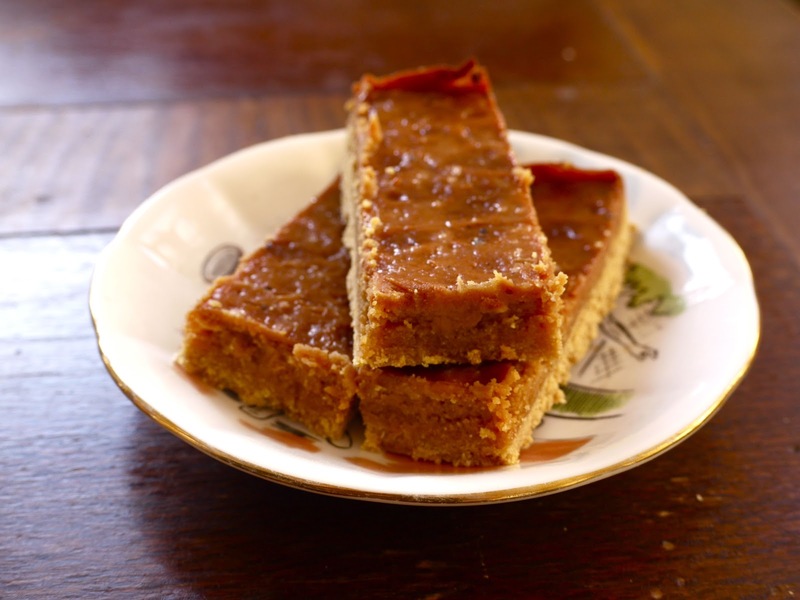 Finally, the sweetened condensed milk feels more heat than usual, boiled away in the pan and then further blasted in the oven, reducing its liquid and making it as spreadable and roof-of-mouth coating as peanut butter. That’s a good thing, by the way. All told, it’s one heck of a recipe. Adapted from a recipe by Fiona Smith, from the September/October issue of Cuisine. For example, I didn’t have a tin small enough and so increased some ingredients. Set your oven to 180 C/350 F and butter and line an average sized slice tin. Mix the brown sugar, cornmeal, flour and baking powder together in a bowl. In a pan, melt 120g of the butter. Pour it into the dry ingredients, mix together well and press into the base of the tin, flattening out carefully with the back of a spoon. Bake for 10 – 12 minutes. In the same pot/pan, melt the rest of the butter, tip in the condensed milk and the golden syrup, and cook over a low heat for six minutes or so, stirring plenty. The caramel should darken slightly and thicken up. Spread it carefully and evenly – it’ll only be a thin layer – over the base, sprinkle with the salt, and return to the oven for another 10-12 minutes. Allow to cool, then slice how you like. It is without hyperbole that I tell you that this is intensely dazzlingly delicious. Real special stuff. The sort of thing you should definitely make for your friends, or even people that you’re hoping to be friends with, because it’s so good and no-one could hate you after eating it, no matter how bad a first impression you made (unless they’re allergic to dairy or something, in which case this would be a really, really bad first impression). And for all that it has three different kinds of sugar in it, it’s not scarily sweet. Speaking of things not scarily sweet, and for the sake of variety: a salad so healthy I served it in a plate shaped like a leaf. 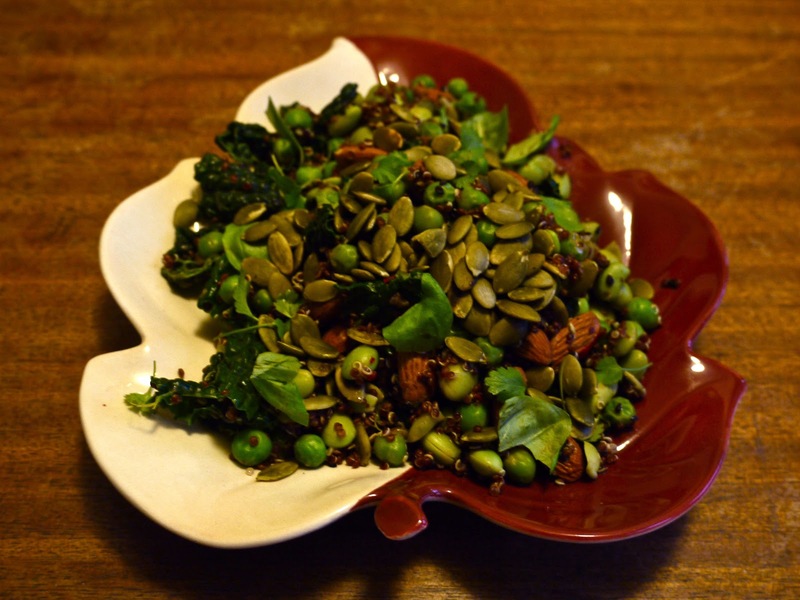 Because none of us will ever have the same ingredients as each other it would be unfair to tell you to stick exactly to this, but it was very good and served to clear out some packets of things that had been guiltily neglected for a while; quinoa, edamame, peas, torn up cavolo nero leaves, toasted almonds and pumpkin seeds, black sesame seeds, and a weird but good dressing involving peanut butter, cider vinegar, nigella seeds, ground cumin, lemon-infused olive oil and…something else that I forget. My rule for dinner salads is that there needs to be nuts or seeds involved, and an amazing dressing, and the rest will all fall into place – just use whatever’s in the fridge, freezer, and cupboard. Title via: Light of the Earth from Godspell, a musical that I love unashamedly (although loving musicals in the first place could be cause of shame for some, but not I!) This isn’t even the best song from it. But it does use the word salt. Music lately: I really recommend listening to Judy Garland’s You Made Me Love You followed by Sherie Rene Scott’s hilarious version from her musical Everyday Rapture. Which does not appear to be on Youtube. But if all you can manage to locate is just Judy’s original or anything by Judy and/or something that Sherie Rene Scott has sung, things are still looking up for you. All Your Love, John Mayall’s Blues Breakers – Tim bought this record on Saturday and I was all “Eric Clapton? Boring!” but actually that was a bit of an unfair call. Next time: While I was at Kate and Jason’s I took stock of their other Lee Brothers book, and from it will be making Banana Pudding Ice Cream. I can’t wait, haven’t done any ice cream in aaaages. Also, If you’re in Wellington, look out for people selling cupcakes for the SPCA on Monday 29, and if you like, be kindly towards them and buy said cupcakes. It’s possibly too late to make some yourself now, although having spent many a midnight frantically baking I wouldn’t rule it out entirely. Whoa, salt in sweet things…I love the taste, specially salted chocolate, still not brave enough to try. What if I ruin it? what then?! That slice is amazing! AMAZING! I must try it. Hi laura! Oh you will no doubt get a lot of use from Good to The Grain, judging from your cooking style. I like your blog! Will be following. How did you come across mine? Nice to be connected with other NZ foodies 🙂 Oh and this slice is being added to the must-make list. Love salt in sweet. I love Godspell…have been in it twice, totally my favourite. I'd love to get up on stage & perform it today, although I don't know how 'Turn back, O Man' would work when sung by an 8 months pregnant chick!! Hi Christina! I think I clicked through to your blog from Two Spoons. And I'm definitely going to look out for that book! Do you know whats even better? Smoked Salt with caramel! This slice is just the best! I liked it even better after a couple of days when the base softened a little. Not that it lasted much longer than that at the rate I was eating it. I cut it into little pieces but then ate multiple pieces at a time! So yum! I can't wait to try making these! I too was a bit blah on Sunday, Saturday really was great! Funny how that happens. This is most definitely on my list of recipes to try – there were so many great ones in Cuisine this time. Sweet and salt – perfect! nice idea .. salt on sweet things .. it will balanced the taste .. thanks for sharing ..